PARIS, France, October 8, 2012 (ENS) – A new 50 million euro investment program to support electric vehicles and charging infrastructure was launched Wednesday by French transport, environment, energy and finance officials. The so-called “Hirtzman Mission” is named after Philippe Hirtzman, an electric transport engineer at the Bercy Economic Ministry who is in charge of overseeing the program. Hirtzman joined Arnaud Montebourg, Minister of Industrial Renewal; Delphine Batho, Minister of Ecology, Sustainable Development and Energy; and Frédéric Cuvillier, Junior Minister for Transport, on October 3 to announce the new program. €7,000 in 2013 and the bonus for hybrid vehicles will be doubled to €4,000. Corporate and public purchasers also will qualify for the bonus in 2013, and Montebourg said the government will ensure that 25 percent of government vehicles will be electric or hybrid. Bonuses related to low-emission combustion vehicles will be increased by €100 or 150 as appropriate, the officials said, and these increases will be valid until the end of 2012. The new funding will cover deployment of charging stations on highways, in parks and in public parking lots such those at supermarkets and shopping centers. Electric cars will benefit from a “preferential rate” for road tolls and parking, the officials announced. Cities or regions of more than 200,000 inhabitants will be eligible for program funding, they said. The new investment is part of the automobile plan presented on July 25 by the Minister of Industrial Renewal. The investment is needed because the French automotive industry is in trouble, the officials acknowledged. Employment in the auto industry fell by 30 percent in 10 years. 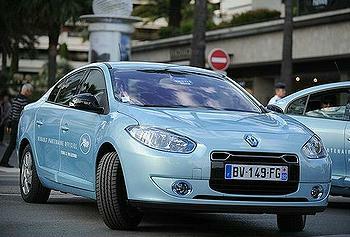 Only two million vehicles will be produced in France in 2012, as compared with 3.5 million in 2005. The industry needs to improve competitiveness, innovation and solidarity with a strong strategy shared by all stakeholders: government, local authorities, social partners, manufacturers, suppliers, subcontractors, distributors and service providers, universities and research centers, the ministers said. The government ministers said they will establish a close collaboration with local communities. The research tax credit be made permanent and more accessible to small and medium-sized enterprises. A research institute dedicated to automotive technology will be launched before the end of this year. As part of the overall program, the GIREVE (Groupement pour l’Itinérance des Recharges Électriques de Véhicules) project is being established. To create the GIREVE, an agreement to develop a common framework for roaming services for recharging plug-in vehicles was signed by PSA Peugeot-Citroën, Renault, the Caisse des Dépôts investor group; and Électricité Réseau Distribution France (ERDF), which manages electricity distribution to 95 percent of the metropolitan areas in the country. With the GIREVE, drivers will be able to locate and use existing charging stations, regardless of who owns them. 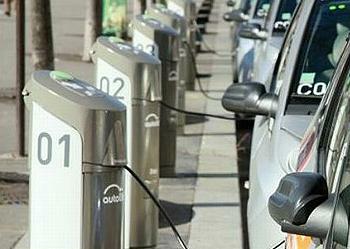 Vehicle and smartphone apps could locate available charge points and book a time to plug in and charge up. The French government will be associated with the GIREVE to ensure its progress, under conditions open to all players, allowing the free creation of services that meet the expectations of users of electric vehicles. At the request of the government, the four signatories of the the GIREVE agreement will conduct a wide-ranging consultation with stakeholders to integrate new partners and provide adequate structural skills and resources. Topping the GIREVE agenda will be the creation of an accurate national map and directory of EV charging equipment. This directory will be made available to operators to expand their services to users. GIREVE will create standards for data exchange based on that directory, also allowing the payment clearing services between operators. And it will represent France vis-à-vis other countries, extending these standards to cross-border trade.